As soon as I saw this gorgeous glitter top coat I needed it in my life. 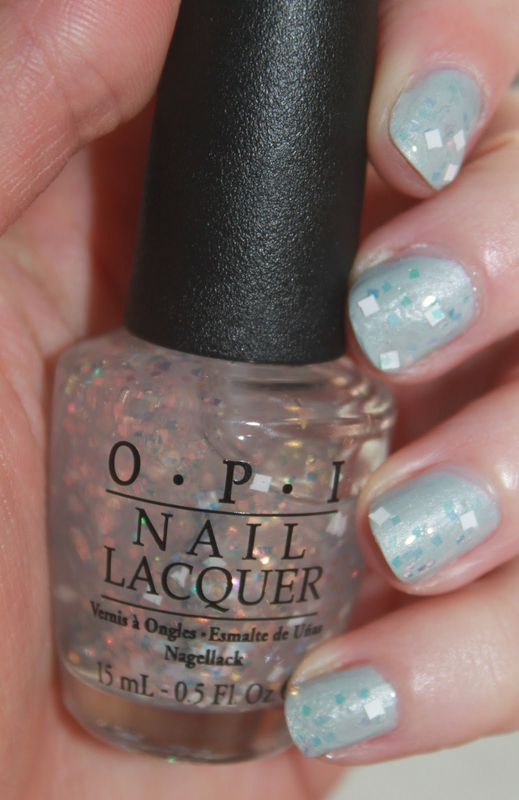 This pretty glitter from the OPI Oz collection has square see throught peach and blue shimmery pieces, and larger square white pieces. In the picture above I've painted Lights Of Emerald City over the top of I Vant To Be A Lone Star, also by OPI. I really love this shade and it looks like a bottle of magic! However when painting it onto my nails I noticed that I had to really try and get the white pieces onto the brush as they're didn't seem to be any. I also noticed the same about Where Monkeys Fly! from the same Oz collection. That aside it looks stunning! Grab it for £11.50 from your nearest OPI stockist or online. What do you think of this pretty glitter? I like this collection but feel the timing for release is all wrong, although it coincides with the film. The shades feel very wintery to me! I agree, it looks like little pieces of ice!! :) it's a shame because its so pretty, doubt I'll wear it much through summer. Roll on winter! This is just amazing! So so beautiful. This topcoat looks gorgeous!! And I love the base coat you used to match it. Gorgeous glitter, I like that it's something s littler different with the big square flakes. Wow this is such a unique polish, love it!